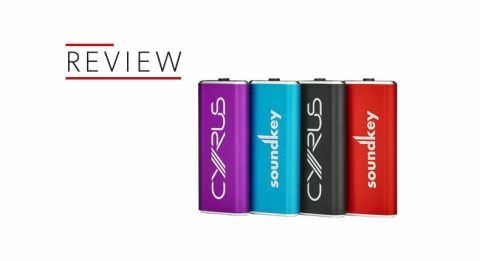 Cyrus soundKey review | What Hi-Fi? If one were to draw up a list of possible contenders for hi-fi ubiquity a year or two ago, safe to say that, only the prescient few would have put ‘portable DAC’ anywhere near the top. And yet here we are. The prevalence of digital music, and the enormous storage capacity of some portable music players and smartphones (not to mention desktop computers), means we can access all our favourite music no matter where we are. But what’s the point if it sounds unsatisfactory? The majority of DACs and headphone amplifiers fitted to smartphones or laptops are the cheapest and most plentiful the manufacturer could find. And we all know what the results of that kind of policy are – just listen to the way your laptop neuters your favourite tunes when you plug your headphones into its socket. The idea of the dedicated portable DAC/headphone amp isn’t all that new – we’ve been giving What Hi-Fi? Awards to products of this type since the start of the decade. So in some ways Cyrus is a little late to the party. But its new soundKey has been worth the wait. When a product needs to be as compact and unobtrusive as possible, there’s little scope for building in perceived value. And it’s true that, despite the smoothly seamless build of the soundKey, it doesn’t necessarily look like £100-worth of hi-fi kit. It weighs in at 18g and is just 8mm deep – excellent from the portability point of view. The aluminium casing feels good, and is nicely chamfered. The logos (‘Cyrus’ on one side, ‘soundKey’ on the other) are raised just slightly to give both tactility and grip. There’s a choice of four finishes (red, purple, black or turquoise) and, in fairness, it’s difficult to know what else Cyrus could have done with a product designed to be as discreet as possible to make it seem any more upmarket than it does. At one end of the soundKey there’s a 3.5mm socket for plugging in headphones (or connecting to a system). At the other there’s a micro-USB socket. There’s no need (nor any room) for anything else. In the box Cyrus provides a cable terminated with a micro-USB at both ends (for use with appropriate Android devices) and a micro-USB/full-size USB cable (for use with laptop or desktop computers). Those wishing to use an Apple phone or tablet will need the Apple camera kit – so the chain from phone to headphones becomes a three-cables-plus-soundKey affair, which is far from elegant. Using a dongle to attach an external DAC to a smartphone is far from uncommon, but it does rather spoil the ‘much-improved sound with very little fuss’ aesthetic. The soundKey is ready to handle a wide range of digital audio file types, most pertinently MP3, AAC and FLAC – and can handle files up to 24-bit/96kHz resolution. It requires Windows 10, Android 5 (or above) and iOS 9 (or above) of its source machine. The first thing that strikes us about the soundKey is the remarkable amount of space it gives to the presentation of a song. This is especially pronounced when listening to quieter, sparser material - a 320kbps Spotify-derived file of Lotte Kestner’s Secret Longitude is a particularly good showcase of the Cyrus’ powers of separation. It opens the recording wide, allowing the tiny details space to reveal themselves and giving the tune a widescreen aspect some lesser portable DACs are simply not capable of. This winning quality is even more obvious when we up the ante to a 24-bit/96kHz file of Aretha Franklin’s I Never Loved a Man (the Way I Love You). It’s a slow-burner of a tune, intense but not all that demonstrative where dynamics are concerned – and the Cyrus establishes a big, well described stage for the players to inhabit. At the same time, it reveals all the character and technique of Aretha’s inimitable vocal in the most natural way. Shifting gears more than somewhat with a 16-bit/44.1kHz stream of Melt-Banana’s Candy Gun via Tidal reveals the soundKey to be reasonably, thought not decisively, dynamic – it has all the fevered abandon the tune requires, but doesn’t quite describe the peaks and troughs as explicitly as some rivals. Comparison with our current favourite at around this price, AudioQuest's DragonFly Black, highlights the soundKey's relative shortage of out-and-out dynamic heft - but at the same time, the Cyrus achieves the remarkable feat of making the Black sound like something of a blunt instrument. It's significantly more revealing, more open and more detailed than the AudioQuest. If we're asked to make a trade-off between transparency and ultimate dynamism, we'll come down on the side of the Cyrus every time. There’s very little downside to soundKey ownership. It’s affordable, compact and high-performance – only iOS-fanciers, with their convoluted method of attachment, will be less than all-around thrilled by the difference it can make to mobile listening pleasure.